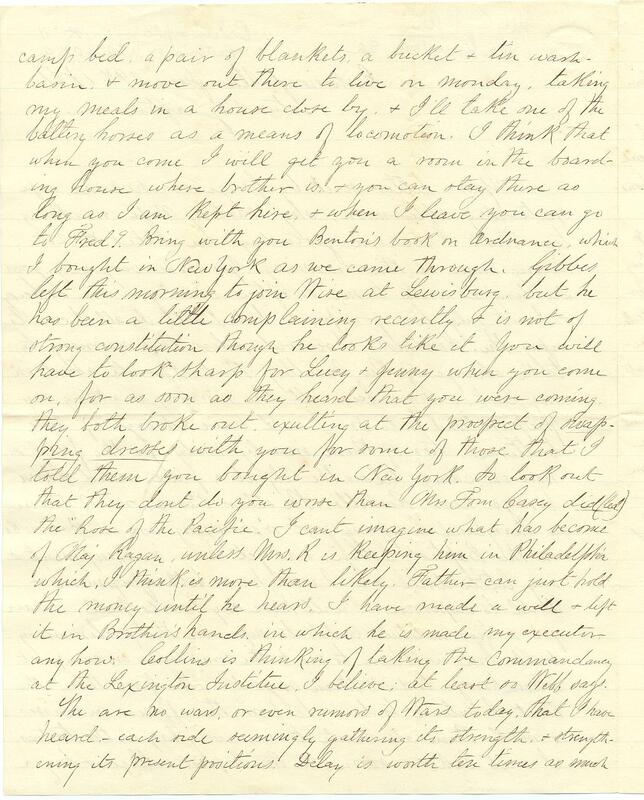 Item description: Letter, 29 June 1861, from Edward Porter Alexander to his wife Bettie. 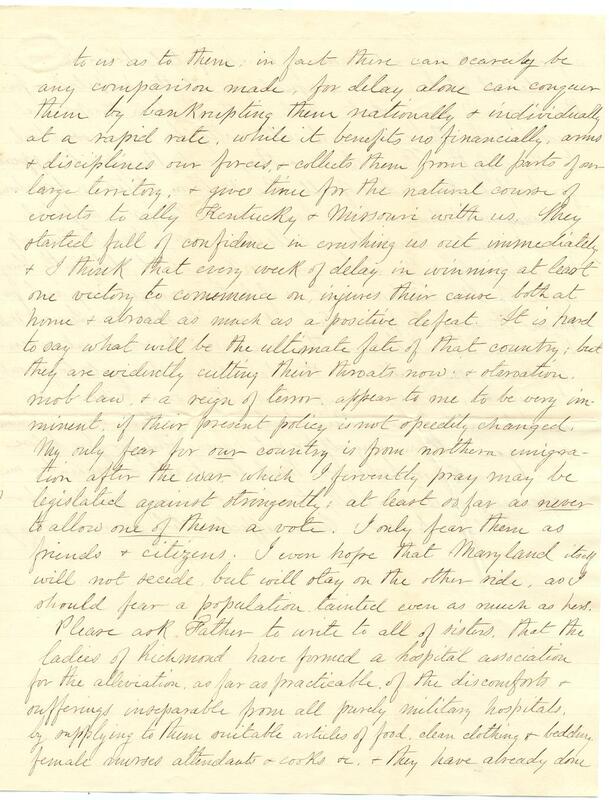 In the letter Alexander describes his new role leading five artillery batteries, and discusses the effect that delays in between battles have on each side (claiming that it benefits the Confederacy because it allows additional time to train and mobilize Southern troops). Your letter sent by George reached me safe yesterday afternoon, my Darling Wife, making two that I received yesterday, one dated the 25th having come in the morning. You are very very good Darling to write to me so often when you are so busy, & I not only love you for it, but I will do all I can to repay the kindness. 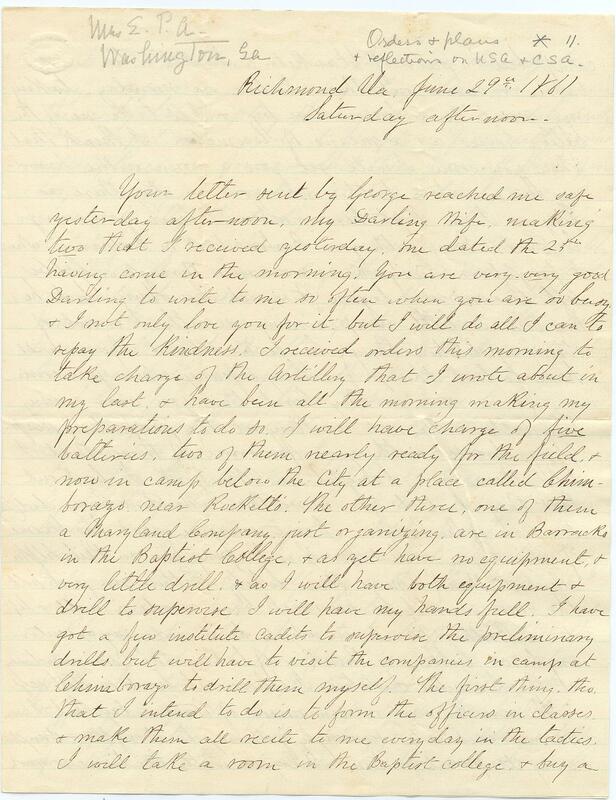 I received orders this morning to take charge of the Artillery that I wrote about in my last, & have been all the morning making my preparations to do so. I will have charge of five batteries, two of them nearly ready for the field, & now in camp below the City at a place called Chimborazo, near Rockett’s. The other three, one of them a Maryland Company just organizing, are in Barracks in the Baptist College, & as yet have no equipment, & very little drill, & as I will have both equipment & drill to supervise, I will have my hands full. I have got a few institute cadets to supervise the preliminary drills, but will have to visit the companies in camp at Chimborazo to drill them myself. The first thing, tho, that I intend to do is to form the officers in classes & make them all recite to me every day in the tactics. I will take a room in the Baptist College & buy a camp bed, a pair of blankets, a bucket & tin wash basin & move out there to live on Monday, taking my meals in a house close by, & I’ll take one of the battery horses as a means of locomotion. I think that when you come I will get you a room in the boarding house where brother is, & you can stay there as long as I am kept here, & when I leave you can go to Fred.[ricksburg?]. Bring with you Benton’s book in ordnance, which I bought in New York as we came through. Gibbes left this morning to join Wise at Lewisburg. But he has been a little complaining recently, & is not of strong constitution though he looks like it. You will have to look sharp for Lucy & Jenny when you come on, for as soon as they heard that you were coming they both broke out, exulting at the prospect of swapping dresses with you for some of those that I told them you bought in New York. So look out that they don’t do you worse than Mrs. Tom Casey did(led)[?] the “Rose of the Pacific.” I can’t imagine what has become of Maj. Ragan, unless Mrs. R. is keeping him in Philadelphia which, I think, is more than likely. Father can just hold the money until he hears. I have made a will & left it in Brother’s hands, in which he is made my executor anyhow. Collins is thinking of taking the Commandancy at the Lexington Institute. I believe, at least as Webb says. The[re] are no wars, or even rumors of Wars today, that I have heard – each side seemingly gathering its strength, & strengthening its present positions. Delay is worth ten times as much to us as to them, in fact there can scarcely be any companion made, for delay alone can conquer them by bankrupting them nationally & individually at a rapid rate, while it benefits us financially, arms & disciplines our forces & collects them from all parts of our large territory, & gives time for the natural course of events to ally Kentucky & Missouri with us. They started full of confidence in crushing us out immediately & I think that every week of delay in winning at least one victory to commence on, injures their cause, both at home & abroad as much as a positive defeat. It is hard to say what will be the ultimate fate of that country, but they are evidently cutting their throats now, & starvation, mob law, & a reign of terror appear to me to be very imminent, if their present policy is not speedily changed. My only fear for our country is from northern emigration after the war, which I fervently pray may be legislated against stringently, at least so far as never to allow one of them a vote. I only fear them as a friends & citizens. I even hope that Maryland itself will not secede, but will stay on the other side, as I should fear a population tainted even as much as hers. Please ask Father to write to all of sisters, that the ladies of Richmond have formed a hospital association for the alleviation, as far as practicable of the discomforts & sufferings inseparable from all purely military hospitals by supplying to them suitable articles of food, clean clothing & bedding, female nurses, attendants, & cooks, etc. & they have already done a great deal of good. Some of our hospitals being in a wretched state. It is designed for all the hospitals & for the troops of every state. 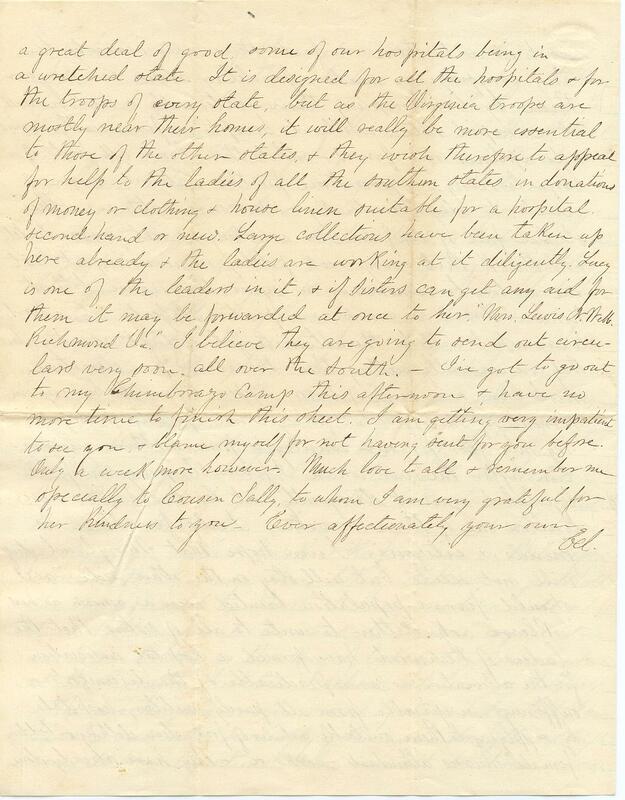 But as the Virginia troops are mostly near their homes, it will really be more essential to those of the other states, & they wish therefore to appeal for help to the ladies of all the southern state in donations of money or clothing & house linen suitable for a hospital. Secondhand or new. Large collections have been taken up here already & the ladies are working at it diligently. Lucy is one of the leaders in it, & if sisters can get any aid for them it may be forwarded at once to her, “Mrs. Lewis Webb, Richmond, Va.” I believe they are going to send out circulars very soon, all over the South. I’ve got to go out to my Chimborazo Camp this afternoon, & have no more time to finish this sheet. I am getting very impatient to see you & blame myself for not having sent for you before. Only a week more however. Much love to all & remember me specially to Cousin Sally, to whom I am grateful for her kindness to you. This entry was posted in Southern Historical Collection and tagged artillery, Bettie Alexander, Chimborazo, delays, Edward Porter Alexander, Richmond, Virginia, women. Bookmark the permalink.